本公司提供的產品及服務由獨立電腦系統到各種技術支援保養, 軟件開發到網絡基礎結構(infra-structure), 辦公室自動化系統(office automation), 工商資料庫應用系統,Web資料庫系統, 電子文件交換及管理, 互聯網, 電郵, 網頁設計 , 企業Intranet應用,數據分析, 保安系統,防火牆(firewall)/VPN, 觸碰螢幕系統(Touch-screen kiosk system)等等. 客戶廣及各行各業,如政府機構, 危機支援中心與中小企業,例如批發業, 製造業, 物業代理, 廣告, 物流, 貿易等等. We have different business nature customer reference like Leased Company, Global Advertising Company, Manufacturing, Factory, Properties Agent, Garment, Transportation, Electronics, Trading etc. Our years of experience and knowledge will give you and your company an cost effective solution and bring up extra competitive power . 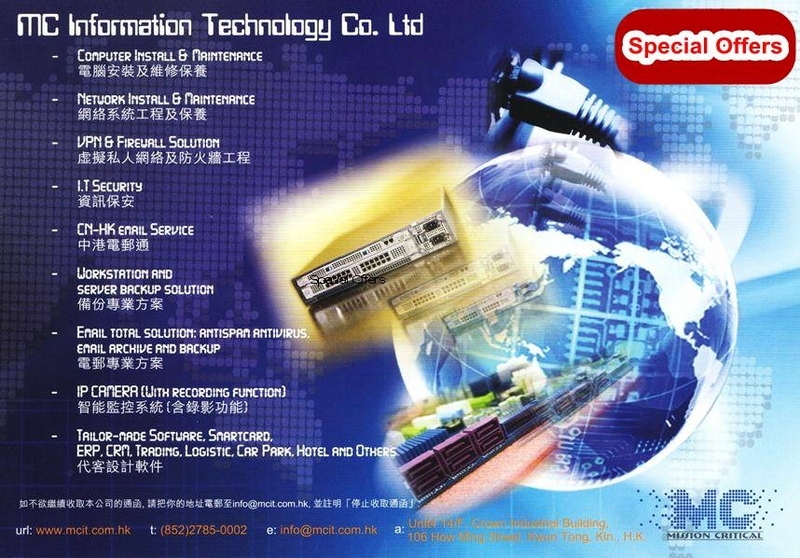 Unit 4, 14/F., Crown Industrial Building, 106 How Ming Street, Kwun Tong, Kowloon, Hong Kong.